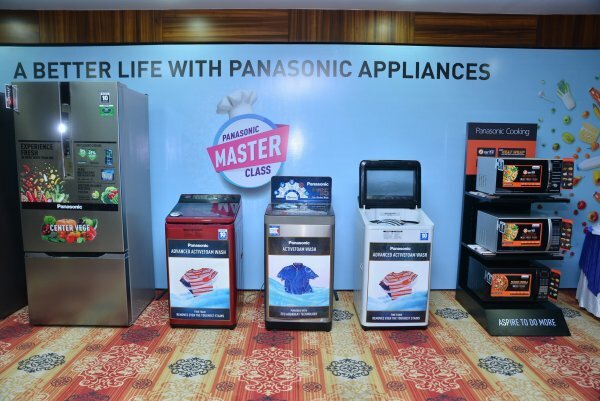 Panasonic known for state-of-the art home appliances which are customized for Indian conditions showcased its range of refrigerators, washing machines and microwave ovens during Panasonic Masterclass session. In this interactive session, renowned Chef Michael Swamy exhibited his renowned culinary skills and prepared scrumptious dishes with zero oil and rejuvenating mocktails using Panasonic’s latest range of intelligent microwaves and refrigerators. The masterclass also showcased how Panasonic washing machines with stain master plus technology is perfect solution for removing all common food stains from curry, gravy, ketchup and other sauces. Panasonic Microwave boast of Zero Oil technology. Panasonic has broken the myth that zero oil cooking means boiled and bland food. Panasonic microwave range has a pre-programmed Zero Oil recipe menu including popular Indian & International recipes that are easy to make and good in taste as well. Michael Swamy prepared lip-smacking warm chocolate mousse & grilled peach salad, hasselback potatoes and baked stuff chicken with salad during the masterclass, without using a single drop of ghee, oil or butter. The microwave range has features like 360 degree Heat Wrap for uniform cooking; Magic Grill for faster grill retaining moisture juices & nutrients; and Vapor Clean for hassle-free and easy cleaning. The range of microwave is available in various colours & steeless steel design to fit every Indian kitchen. Panasonic refrigerator range is equipped with an Intelligent invertor & ECONAVI technology that adjusts its operations as per the user household requirement, to ensure optimal cooling & energy savings. Equipped with AG Clean technology, it also helps retain freshness by removing 99.9% of bacteria. It also has the biggest vegetable case for storing vegetables and fruits. The Surround Airflow cooling system allows airflow to softly wrap each of the food items and cool them evenly. Panasonic Stain Master Plus series is powered by ‘Active Foam Technology’. It uses Foam to remove stubborn stains such as Mud, Sweat, Sauce, Curries and difficult to clean areas like Cuffs & Collars, at a press of a button. Additionally, the bacteria elimination feature in Stain Master plus Models, soaks and washes clothes in hot detergent solution to eliminate common Bacteria like E-Coli & Staphylococcus for an extra hygienic wash.